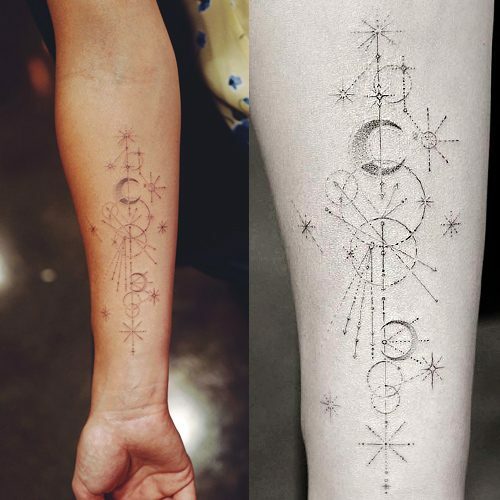 Olivia Wilde has a galaxy design tattoo on her right forearm. 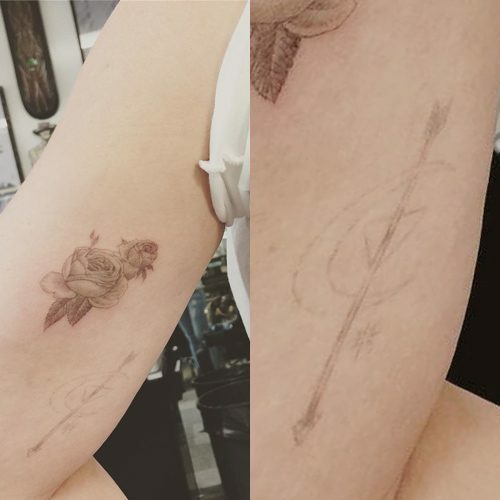 Hilary Duff has a tattoo inside her right bicep with a crescent moon and star and a triangle cut by a pointed down arrow. Lily Allen has nine tattoo small tattoos wrapping around her wrist like a bracelet. 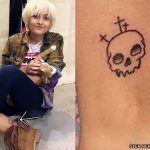 She started on the inside of her wrist with seven symbols — five to represent different major world religions along with a communist symbol and, oddly enough, Homer Simpson’s head. 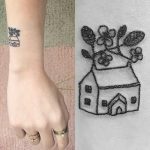 She later filled in the empty space on the back of her wrist with two more fun and lighthearted tattoos of a happy face and a cartoon dog. 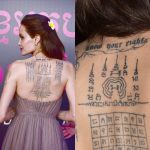 Lily has never explained why she chose to get these symbols tattooed on her, but she has expressed some very mixed feelings about religion. She was raised Catholic but told Word magazine that she is “confused by religion” because the values that the religion preached were often at odds with how her parents acted. “I was brought up in a Catholic school and they told me gays were bad, adultery was bad and drugs were bad,” she says. “At the same time, all my mum’s friends were gay, my dad was having various affairs and there were drugs in the house when I was a kid – so it was a bit cruel.” She respects many religions and has said that she is particularly fond of Hinduism. Om (ॐ) is a common symbol of Hinduism, though Om is also important in Buddhism, Sikhism, and Jainism. Om is the divine energy of the universe. The six-pointed Star of David (✡) is a symbol of Judaism. This tattoo is a silhouette of the Buddha sitting in a meditation pose. This of course represents Buddhism. The star and crescent (☪) is a symbol of Islam. The Latin cross (✝) is the most predominant symbol of Christianity, representing the cross that Jesus was crucified on. The hammer and sickle (☭) is not a religious symbol, but a political one. It represents communism. The two item represent industrial and agricultural workers and crossed they symbolizes the unity between the different social classes. The barking dog comes from the works of artist Keith Haring, whose pop art style drew much of its influence from graffiti. Lastly Lily has a smiley face (☺), a symbol of happiness.